It is not hard to understate the influence that Apple has had on China. If we examine the role the country plays in the supply-chain of Apple products, then China’s relationship with the company is undeniable. It is safe to say that without China’s contribution to the manufacturing and assembly process, Apple’s stylish products would be unaffordable to the average consumer around the globe. That’s why last year when a string of suicides hit Foxconn, the company that manufactures products such as the iPad and iPhone, Steve Jobs was quick to announce that Apple would look into the working conditions. Jobs, a marketing genius, knew that negative PR associated with Foxconn would hurt Apple’s sleek and stylish image in the U.S.
What commentators in the U.S. failed to notice is the relative ambivalence of people in China regarding the Foxconn suicides. When I asked my Chinese colleagues what effect the incident had on their perception of Apple, they responded that there was absolutely none. Not only that, they defended Foxconn by saying that the rate of suicides among workers (there are tens of thousands of them) is not abnormal for society at large. The willingness to defend Apple and its manufacturer is a testament to the huge popularity of the brand in China. From first-hand observation, it seems that Apple products are as ubiquitous here as they are in my native Silicon Valley. It is certainly not only about function- rather, owning an iPhone or iPad is akin to owning a luxury handbag from Hermes or Prada. I know many people who are willing to spend 2 or 3 months salary or even borrow money from friends to purchase an iPhone. Perhaps more baffling is the fact that Apple products cost more in Mainland China than they do outside. This defies logic given that most of the products are made here…one would think that a reduction in transport cost would bring the price down. The reality is that despite being ‘made in China’, Apple products are treated as ‘imports’ and are taxed as such. This is done to encourage the consumption of domestic products rather than foreign competitors. 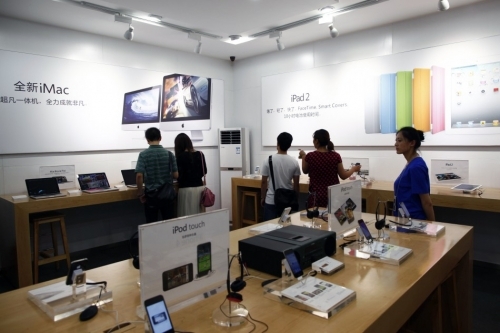 The high price point has done nothing to deter Chinese consumers from buying Apple products. Even when the comparable Lenovo tablet computer is advertised for 1000 RMB (~$156.00 USD), Chinese consumers are willing to pay 4 to 5 times that price just to have the iPad. Furthermore, the desire for Apple products has created an illicit industry of smuggling from Hong Kong and other places. Not long ago, authorities shut down a zipline stretching across the border from Hong Kong into the Mainland city of Shenzhen. Flying on that zipline was none other than shipments of iPads. Women in overcoats concealing a body covered in iPhones and iPads have also been caught trying to cross the border between Hong Kong and Shenzhen. In a country known for its knock off products, Apple products are worth the price of their authenticity (even if those real products are purchased in ‘fake’ Apple Stores). Given this fervor, the overwhelming reaction from Chinese Apple fans upon hearing about the passing of Steve Jobs is not surprising. Netizens took to Weibo (China’s ‘Twitter’) commemorating his contributions to the world. Others visited Apple vendors around the country to offer their condolences in person. Steve Jobs’ popularity in China demonstrates a universal admiration for ground-up innovation and entrepreneurship. Despite having a reputation as a culture that discourages innovation and forces workers to ‘toe the line’ in order to maintain social stability, China’s rising living standards and gradual shift to consumer economy will create an environment more conducive to the kinds of innovations that have come out of places like Silicon Valley in the past. American economist Panos Mourdoukoutas disagrees with this notion in a recent Forbes article (Why China Doesn’t Have It’s Own Steve Jobs). Mourdoukoutas cites the ‘nature of Chinese institutions’ and ‘lack of incentives to develop pioneering products’ as reasons for this being the case. While looking back at the past few decades, his observations might be correct, looking into the future, he could not be more off the mark. As I have said before, China’s economy is in a constant evolutionary state. What may appear a static, archaic, and centrally controlled beast from the outside is certainly not reality within China. One only needs to look at the evolution of China’s neighbors, Japan and South Korea- both places once known as bastions of intellectual property theft- to get an idea of where China is headed in the innovation department. Only this time, the scale will be much larger. On the ground here this is already happening, but the process might be too gradual for outside observers to see. If reverence for Steve Jobs is any indication, China is in for a golden age innovation and entrepreneurship…the people here are hungry for it.